Griffon Corporation traces its corporate roots to the defense electronics industry that developed in the greater New York City area. In 1959, Long Island businessman Helmuth W. Waldorf – a tool and die maker’s apprentice who had immigrated to the United States from Westphalia, Germany, to study at Columbia University – formed a small defense electronics company named Instrument Systems Corporation (ISC). 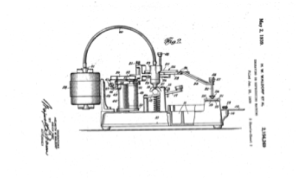 Waldorf was granted numerous patents, from hat-making devices to engraving machines. His focus on innovation and engineering helped to establish the company’s trajectory as investors in product manufacturing and industry development. Image courtesy of the US Patent and Trademark Office (USPTO), H.W. Waldorf Et al. 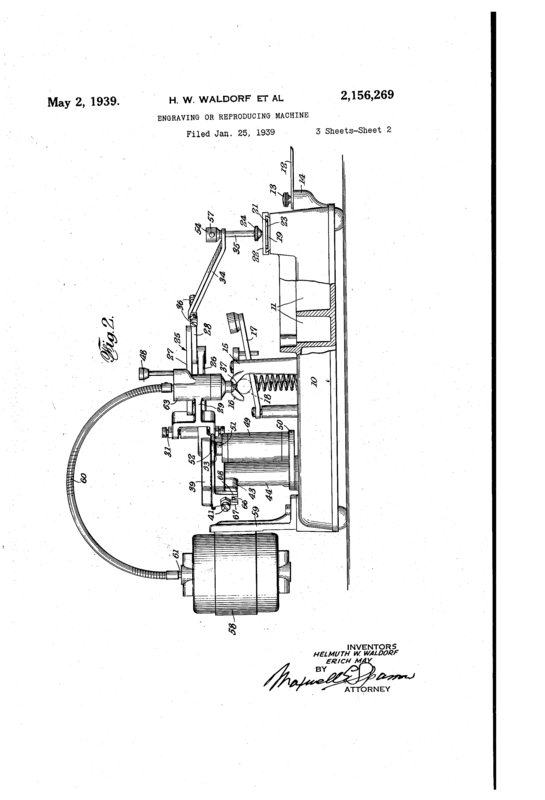 “Engraving or reproducing machine,” US patent, May 2, 1939. Instrument Systems Corporation bolstered its aviation electronics business with the 1961 acquisition of Telephonics Corporation. Telephonics was among a handful of aviation electronics pioneers that formed the nucleus of the aviation electronics and defense industry on Long Island. Founded in 1933, Telephonics had built a legacy developing advanced communications systems, beginning in the 1940s with their first contract to provide headphones and microphones to support the U.S. defense efforts. Garrett was a technical visionary as well as a seasoned businessman. In 1944, he was one of the engineers who developed the EDVAC, the first digital computer designed for civilian use coming out of World War II, and in subsequent years he continued this legacy, promoting the use of digital technology in the company’s products. “Boeing’s 747 superjets will seat 363 passengers when they go into regular service in late 1969. 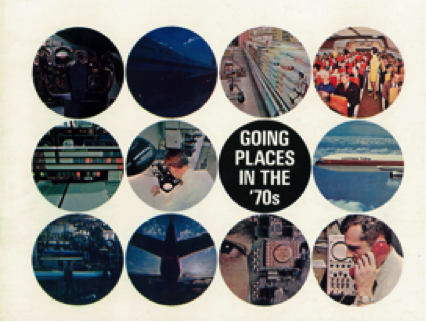 ISC/Telephonics is supplying the passenger service and entertainment system for the 747,” Instrument Systems Corporation Annual Report, 1968. 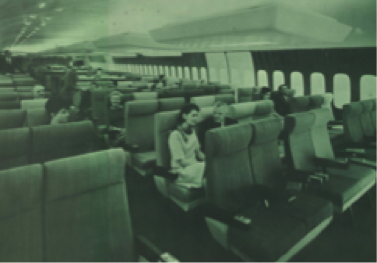 The company’s single largest contract of the late 1960s was the development of a passenger entertainment system for Boeing’s new wide-body 747 airplanes. The contract allowed Griffon to leverage the company’s experience developing technology for the U.S. government by applying its capabilities within a civilian market. The Boeing system was one of the first in the world to use digital multiplexing to carry multiple channels of entertainment on a single wire, and used lighter-weight coaxial cable rather than copper. The end result eliminated approximately 25 miles of wire and 1,000 pounds of weight from each aircraft. Garrett strengthened and repositioned Instrument Systems through a series of acquisitions, expanding Instrument Systems rapidly into an array of defense and commercial electronics and manufacturing businesses. Garrett and his leadership team bought 20 companies in 1968 alone. That same year, Instrument Systems was listed on the American Stock Exchange. Instrument Systems Corporation, Annual Report, 1969. Garrett’s strategy accelerated the growth of Instrument Systems at an astonishing rate, transforming it from a small Long Island electronics company in 1963 to a nationally recognized industrial conglomerate in only seven years. Instrument Systems made its first appearance on the Fortune 500 list of America’s largest companies in 1970, and made the list again in 1971. Following Garrett’s passing in 1982, Harvey Blau was named Chairman of the Board and CEO of the company. Blau, a former assistant U.S. Attorney for the Southern District of New York, was originally hired by Instrument Systems in 1966 to act as the company’s legal counsel, and later served as corporate secretary and Vice Chairman of the Board. Blau accelerated a divestiture and cost-cutting initiative and improved the company’s finances by raising capital via a rights offering to existing shareholders. In addition to strengthening ISC’s existing lines of business, Blau pursued a price-conscious acquisition strategy and reestablished a conglomerate structure by purchasing undervalued growth-oriented companies in unrelated industry sectors in order to diversify ISC’s source of revenue and earnings. In 1984, ISC acquired troubled clothing manufacturer Oneita Knitting Mills. Blau and his team renamed the company Oneita Industries, restructured its finances, and grew it into the country’s third-largest maker of specialty T-shirts, tripling sales to $300 million within a few years. ISC took Oneita public in 1988, selling 34 percent of shares for about $9 million, and had divested the remainder of the company by 1993. The company’s most successful diversification effort of the 1980s was the purchase of Clopay Corporation for $40 million. Under Blau’s leadership, Clopay’s plastics and garage door divisions grew through building long-term relationships with key strategic business partners. Instrument Systems captured the essence of the heritage electronics business, but the name no longer reflected the evolution of the company. In 1995, Blau decided to rename the company Griffon Corporation, after the part lion, part eagle mythical creature that represented strength through diversity, just like his company. Griffon experienced a period of strong growth from the mid-1990s through the mid-2000s. Telephonics won its first contract in excess of $100 million and expanded into wireless communications for mass transit. Griffon’s Clopay garage door division expanded during the U.S. residential housing boom, and added a home installation service business for homebuilding products. Clopay’s plastics division expanded its manufacturing overseas with the 1996 formation of Finotech, a joint venture with Corovin GmbH of Germany to manufacture specialty plastic films and laminates in Europe. The success of that joint venture provided a platform for further international expansion in the years ahead. Blau and the Griffon board turned to Griffon Vice Chairman Ronald J. Kramer to succeed Blau as CEO, effective April 1, 2008. Kramer, then President and a Director of Wynn Resorts, also served as a Griffon Director since 1993 and Vice Chairman since 2003. Blau remained Non-executive Chairman. Upon Blau’s passing in January 2018, Kramer was named Chairman of the Board. Under Kramer’s leadership, Griffon began building for the future. The company secured a new line of credit, made the difficult decision to exit the once-lucrative installation services business and engaged with Goldman Sachs to lead a $250 million recapitalization to position the company for future acquisitions. Wanting the corporate leadership team to be closer to the heart of the financial world in New York City, in 2010 Griffon moved its corporate headquarters from Jericho, New York, to 712 Fifth Avenue. After this strengthening of the company, Griffon made significant acquisitions. In September 2010, the company purchased the leading North American non-powered landscaping tool manufacturer, AMES True Temper, and a year later the company expanded the AMES division with the purchase of Southern Patio. Now called The AMES Companies, the business continued to grow in fiscal 2014 with the acquisition of two Australian companies, Northcote Pottery and the Cyclone tools division of Illinois Tool Works, which together formed the basis for the AMES operations in Australasia. Starting in 2017, Griffon executed a series of transactions to increase shareholder value and reshape the company’s portfolio to focus and strengthen its core business. In October 2017, Griffon acquired the ClosetMaid home storage and organization business, and later combined it with AMES to unlock additional value though complementary customers, warehousing and distribution, manufacturing, and sourcing capabilities. In November 2017, Griffon announced the sale of Clopay Plastics. This transaction, completed in February 2018, marked Griffon’s exit from specialty plastics, provided immediate liquidity to the company, and improved the company’s cash flow conversion. Griffon closed a number of smaller acquisitions in 2017 and 2018 to strengthen The AMES Companies worldwide. In the UK, Griffon acquired La Hacienda, an outdoor living brand of unique heating and garden décor products, and Kelkay, a manufacturer and distributor of decorative outdoor landscaping, in April 2017 and February 2018, respectively. These acquisitions established a platform for AMES growth in the UK market, providing channels to leading garden centers, retailers, and grocers in the UK and Ireland. In Australia, Griffon started 2017 announcing it had acquired Hills Home Living, the iconic brand of clotheslines and home products, from Hills Limited. Later that year, Griffon acquired Tuscan Path, a provider of pots, planters, pavers, decorative stone, and garden décor products. Both of these businesses expanded AMES’ offerings in the Australasia market. In the United States, Griffon acquired Harper Brush Works in October 2017 to expand the AMES line of long-handle tools to include brooms, brushes, and other cleaning products. In June 2018, Griffon bolstered its Clopay Building Products subsidiary with the acquisition of CornellCookson, a leading provider of rolling steel service doors, fire doors, and grilles. This transaction rounds out Clopay Building Products portfolio with a line of commercial rolling steel products which complement Clopay sectional door offerings for the commercial industry.